Last year was a great year for the XRT-C project. We finally found a home for our telescope, secured enough funding to keep the project running and got some of the components bought and ordered in preparation for construction later this year. While attending outreach events, there’s been nothing we enjoy more than interacting with you and answering your excellent questions. We get loads of them, and it’s often hard to give a satisfying answer in the short time we get to talk to you, so I’ll start off 2015 by answering a few of them in our first FAQ. Without further ado, here we go. We don’t really see anything through our telescope, in the conventional sense anyway. Telescopes as most people think of them work by using carefully crafted lenses and mirrors to focus visible light onto some kind of eyepiece or sensor. However, radio telescopes work a little differently. Our telescope is going to use a 4.5 metre diameter parabolic dish to reflect radio waves, which are a lower energy version of the visible light that we can see, into a feed horn that is connected to electronics that boost and process the signal we receive. If we point the dish at different parts of the sky and plot the observed intensity against its position we can build up a map of the radiation. In our case, we are observing emission from hydrogen clouds in space. In this post the process that gives off these radio waves is described in depth. So, instead of seeing visible light as traditional telescopes do, our radio telescope ‘sees’ in the part of the electromagnetic spectrum that neutral hydrogen glows in. So, the map that we build up shows us the location of hydrogen in our galaxy. Basically, we can see neutral hydrogen through our telescope. This images describes the process which gives off the radiation we detect. This is when the spin of an electron, a quantum property which can either have the value of up or down, flips from the up state to the lower energy down state; giving off the excess energy as radio waves. Although this process is incredibly unlikely, the amount of neutral hydrogen in the observable universe make it a viable thing to observe. What is the resolution of your sensor? Once again, this one is a little more difficult to explain than simply quoting a number. When we refer to a resolution, we are usually referring to the number of pixels that we have on a Charge-Coupled Device (or CCD) connected to the telescope. These devices are generally used in astronomy to capture photons that are captured by the telescope. These photons excite pixels on the sensor and read out in the form of electrical signals to a computer. This is how most modern astronomy and astrophotography is done. However, once again, because we’re using radio waves instead of visible light the process is a little more complicated than that. When a photon collides with a pixel on a CCD, the electrons in the pixel get excited up to something called the conduction band, meaning that the pixel gets activated. For this to happen the photon has to have enough energy to excite these electrons up into the conduction band. The minimum energy to do this is called the activation energy. This method works fine for infrared light and above, but when you get to energies low enough for radio waves, it becomes really difficult to engineer devices that aren’t activated simply by the ambient heat and can reliably capture the photons. So in radio astronomy we instead use a feed horn. This is an antenna which is mounted at the point to which the dish focuses all the radio waves. This antenna converts the incoming signal to an alternating current, which is then boosted using a receiver. This current is tiny, which is why it’s very important to get a very good amplifier, else you achieve a poor signal-to-noise ratio (S/N). This design means that we don’t have a resolution so much as a cone in which we receive radio waves, also known as a beam. This is effectively one massive pixel. This on its own has a relatively poor resolving power in comparison to optical telescopes, however if you have an array of radio telescopes you can use a method called interferometry. This method allows you to combine the signals from multiple dishes and greatly increase your resolution. This could be a possible direction for the project in the future, but at the moment we’re sticking with one dish. 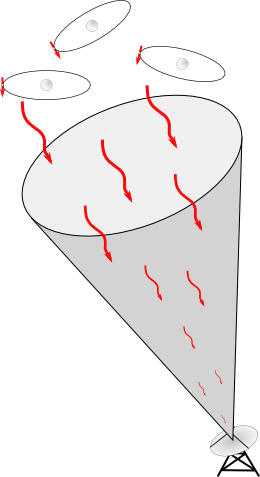 Radio telescopes have complex pickup patterns, however they can be visualised simply as a cone emanating from the centre of the dish. Radiation that travels down the cone gets picked up and added to the total flux for the current observation by the computer connected to the telescope. What do you want to do with your telescope? There are two main purposes for building the telescope. It’s designed to be a professional grade research tool, so we’d like to use it for scientific research. The science posts written by the previous leader of the science team, Ben Drummond, give some great insight into the kind of science we hope to achieve with the telescope as well as the physics behind it. In a nutshell, the first main project we hope to work on is weighing our galaxy; the Milky Way. We can do this by measuring the Doppler shift of hydrogen clouds in the galaxy, allowing us to construct a map of velocity for the galactic disk. This allows us to then figure out how much all of this weighs thanks to considering the energies involved. The other focus of the project is to inspire people to get involved with science. We hope to use the telescope as a tool to engage with the public and make it possible for other students to get involved with the project. On that note, this is where you come in. If you have any questions about the project, radio astronomy, or the physics behind it all, go and leave them on our Facebook page or reply to us on Twitter @XRTCaradon. We’ll collect them to answer in a future post. Thanks to everyone who has been involved with the project and supported us at events throughout 2014 and we look forward to what 2015 has to hold for XRT-C.
by Sam Morrell – Science, Outreach and Press & Publicity teams.